Teri Page always loved to teach people how to get better in touch with the world around them. For years, she taught marine biology and led youth backpacking trips in the National Parks. Page and her husband, Brian, had recently finished working at a sustainability education center in Oregon when they decided to strike out on their own. Blogging about her journey on Homestead Honey — and teaching her readers how best to start their own homesteading journeys — seemed only natural. Since then, life has sent Page, her husband and her kids on a number of different homesteading journeys, from living off-grid in Missouri to homesteading on a rental property in Vermont. Transitions are vital to Page’s story, and they are what makes her blog interesting to read. Hello Homestead: How did you get started homesteading? Teri Page: My husband and I lived at a sustainability education center in Oregon in the summer of 1999. My job was to work in the organic gardens, where I immediately fell in love with growing food and medicine. Soon after, we moved into a small rental on 35 acres and expanded our homesteading knowledge by growing as much food as possible and raising animals. We haven’t stopped since! HH: What did you do before you started homesteading? TP: My first degree was in Biology, with an emphasis in Marine Ecology. I spent the school year months teaching marine biology to kids on Catalina Island, California, and the summers working at National Parks and marine centers across the country and leading backpacking trips for youth. HH: Why did you decide to blog about your experience? TP: I’ve always been an educator, and I enjoy sharing my passions with others through writing and teaching. Blogging seemed a natural fit! TP: I think each individual “Radical Homestead” is going to look and feel very different. I think of radical as swimming upstream and defying convention in order to live your truth and passions as fully as possible. A “Radical Homestead” might go against what others think is impossible, or it might be the culmination of your lifelong work. It is the result of prioritizing and living into the biggest, boldest version of your homestead dream. HH: You had your children a few years into your homesteading journey. How did you adjust to being a mom and a homesteader? TP: Because we had already spent many years homesteading, and therefore living with gardens and farm animals that required a great deal of care, the transition to being a mom and homesteader was very easy for me. Of course, I couldn’t have done it without the partnership of my husband, Brian, but from the beginning, we involved our kids in every aspect of homesteading life. One of my favorite memories is carrying my infant son to the barn each morning in a basket so he could accompany me to milk the goats! HH: What are your tips for parents who want to homestead? TP: Go for it! 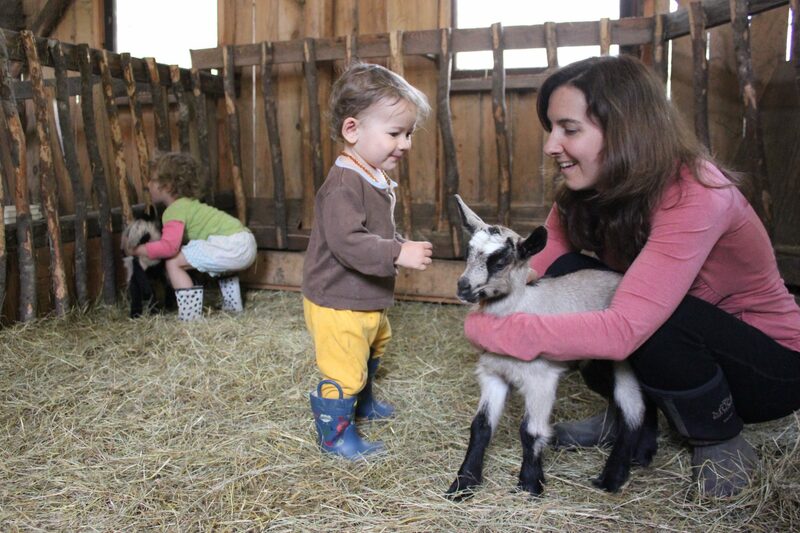 It’s such a rewarding lifestyle, and children are such natural participants in the wonders of homesteading. Of course, if you have older children, it’s important that they are on board with your lifestyle choices. Even if you don’t embrace the homesteading lifestyle 100 percent, there are so many small steps that you can take — and share with your children — from growing food and preserving food, to creating herbal remedies, to foraging for food. My book, Family Homesteading, is full of projects, recipes and ideas to share homesteading with your children. HH: You moved from your homestead in Oregon to one in Northeast Missouri. What were the biggest adjustments between homesteading in those two places? TP: Gardening in a new climate came with a large learning curve, but it was really the fact that we started our Missouri homestead from scratch and lived off the grid that required the biggest adjustments. We had to learn how to live without many creature comforts that we had once taken for granted. Fortunately, we had lots of camping and backpacking experience to help us! HH: While living in Missouri, you lived in an off-grid tiny house. Why did you decide to go off-grid at that stage of your homesteading journey? TP: Our decision to live off-grid was part philosophical, part practical. We wanted to reduce our impact on the Earth and didn’t feel good about coal-burning power plants, so we were excited about renewable energy options. We also built quite a distance from the main road, so electric and water hookup would have been quite expensive. Living off the grid felt like the right choice, from all angles. 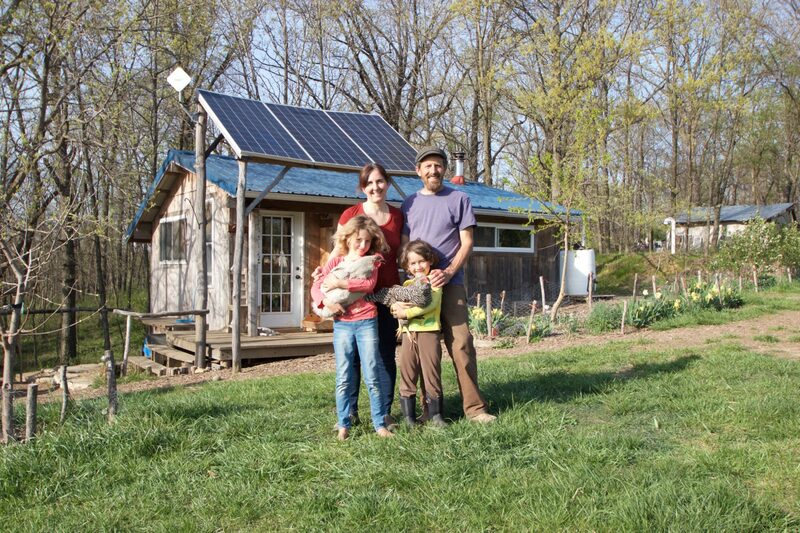 HH: How did you manage off-grid living with the energy needs of a family of four? TP: If you want to live off-grid and have the comforts of a modern home, you can — with enough solar panels and batteries! We installed a rather small photovoltaic system to start, so we had to monitor our energy use closely. We were not able to hook up an air conditioner or a refrigerator, but we came up with creative solutions that worked well. HH: What was it like living in a tiny house with a family of four? TP: Crowded! We maximized every inch of space in our house and had to be very intentional about organization and neatness. But honestly, I loved being so close to my family. Some days I shooed the kids outside to have a bit of space, but mostly we enjoyed living together in a very cozy and well-designed home. HH: Now you live in Vermont. What made you decide to move there? TP: Life sets you on strange and circuitous paths sometimes! Although we loved our Missouri homestead, our family’s needs had changed. We spent several years figuring out where we should move and Vermont rose to the top of the list as a beautiful state with a strong homesteading and farming tradition, many options for education and lots of arts and culture. Plus, Vermont is closer to my family and many of our long-time friends. HH: How was the move from Missouri to Vermont different than the one from Oregon to Missouri? TP: When we moved to Missouri, we had already purchased land and were brimming with ideas about house and garden design, animal husbandry and more. It was a time of great possibility and quite exciting because it was the fulfillment of a years-long dream of owning land and building our own home. Our move to Vermont was more about meeting the needs of our children, and, because we are renting and do not know what lies in store for our future, it has required (and still requires) a great deal of trust that we will end up exactly where we are meant to be. HH: How is your homesteading life different in the Northeast so far? TP: We are renting once again, which does somewhat limit what we can take on as homesteaders. That said, we are still foraging, gardening, raising animals, fermenting, making herbal medicine, etc. In other words, the fact that we can’t tackle big projects like building an off-grid cabin or a root cellar hasn’t limited our ability to live an interdependent and self-sufficient life. One thing I’m really enjoying about homesteading in the Northeast is that the cold weather and snow cover gives you a true pause in the winter months. HH: Where does your family income come from? TP: We strive for a diverse income stream so we are not surprised if one income stream dips. My husband and I both own our own businesses. He is a carpenter and artist blacksmith, and I am the author, blogger, a life and business coach and a yoga teacher. I also work part-time as a chocolatier! HH: How do you cope when you face challenges on your homestead? TP: Challenges are a normal and natural part of homesteading, so you quickly learn to be resilient and to expect the unexpected. Honestly, at this point, I’d be surprised if one of my homesteading plans goes smoothly! It helps to enter the homesteading lifestyle knowing that you will have to be adaptable and to welcome challenges as opportunities to learn and grow. HH: What is your number one tip for new homesteaders looking to get started? TP: My advice is to pick one small step that will make the most difference in your life, and just do it! Perhaps that is cooking more at home or seeking out farm-grown ingredients. Perhaps that is learning to grow and preserve food. Maybe it’s making your own herbal remedies. Start very small and learn one new skill at a time. Seek out mentorships and opportunities for support; for instance, I run a 10-week group coaching program for women wanting to get support as they take action toward their homestead dreams, and I’d love to see you there!